“A sooty bamboo” was used in the old traditional houses as a material for roof tiles to cover the hatched roofs. It used to be blackened by the smoke from the furnace for 100, 150 years and its color changed, its core hardened and it became a good, solid material. Even the same bamboo, depending on whether it faced the back side of the furnace or was used on the side that was not exposed to so much smoke, had different color. This is the good quality of the bamboo and the interesting thing about the natural material. The sooty bamboo has been used since the old times as a precious material for the tea ceremony goods and nowadays, when the number of hatched roofs is getting smaller, it is even rarer and more valued. This fountain pen, which uses such a precious material, changes its color depending on the direction the pen is held. Moreover, natural scratches and bruises add some special wild taste to it, which makes you feel the history. 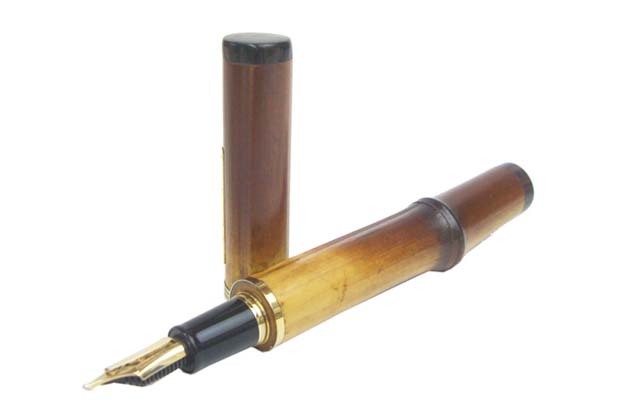 The special pen nib used with this thick pen holder is made in away that enables comfortable writing. This is the pen nib called “The Cross Point Emperor” made by the master of pen nibs, Mr. Nobuyoshi Nagahara, who has created many famous works. Its looks is also a little bit unique, on top of the pen nib there is a faucet-shaped part that prevents the rapid consumption of ink and enables stable ink supply of the Emperor nib. The cross point is a pen nib, in which there is a double pen nib made into one and the pen point and the ink groove is made into a letter X shape, which makes possible to write extremely bold letters, close to writing with a brush. The Master Nagahara has been involved in the production of pen nibs and fountain pens for many years and he traveled around Japan with his “Pen Clinique”. The pen nibs made by master Nagahara, who had to retire, and the materials used by him, are beautiful and precious masterworks. 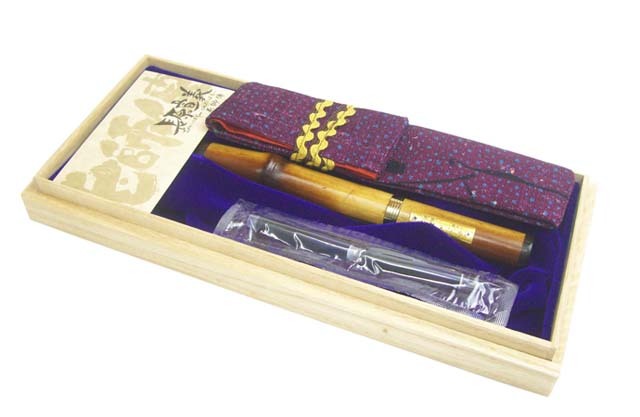 Please look at this beautiful fountain pen and others in our online store under the stationery category!